Cushing residents enjoy amenities common only to much larger communities, such as a full-service regional hospital and a major healthcare center. 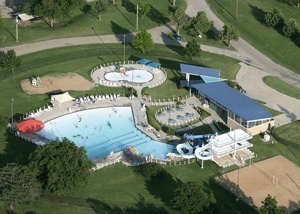 The city-owned Cushing Aquatic Center and waterpark provides a full day’s entertainment in the summer months for a fraction of the cost of commercial water attractions. Excellent public education, serving just over 1,800 students district-wide, is another benefit residents say drew them to Cushing. Community theatre, bowling, golf, cinema and numerous restaurants offer residents entertainment on demand close to home. Keystone Lake is only 25 minutes away, and the major cultural attractions in Tulsa are just one hour’s drive. See Oklahoma City and all it has to offer whenever you want, it’s 90 minutes from Cushing, but come home to a town where personal connections are easy to make. This website is under construction and more information will soon be available in this section. Until then, we encourage you to contact us with any questions and to see more about Cushing on the Cushing Chamber of Commerce website.